The Hong Kong Airport is an easy gateway to Asia, and one of the easiest airports in the world to travel through. The Hong Kong International Airport is the gateway to Asia for us. Almost every time we have visited Asia, we have flown from Toronto to this awesome airport. 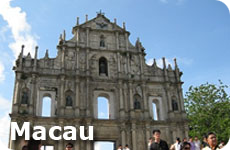 We then transfer to Macau by ferry to recover from our jet lag and to enjoy the casinos. We then spend a few days in Hong Kong with our good friends who live there. HKIA has won several awards and in 2011 was voted the worlds best airport by the passenger survey done by Skytrax. We can see why. 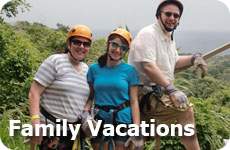 It is easy to get around, whether you are arriving or departing from the Airport, or just transferring through. And if you can't find your way from signs or the departure/arrival boards, there are always ambassadors to help you find your way. Our first arrival at the Hong Kong Airport was during the H1N1 Flu epidemic. THis city was severely hit financially and socially by SARS and doesn't mess around. Because of this, many people were wearing masks. To be honest it was a little unnerving. However our friends soon explained that this was a courtesy thing. If someone is wearing a mask it is because they aren't feeling well and don't want to pass on their germs to you. That made us feel much better. 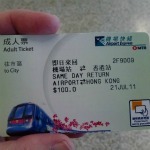 It is easy to get into the city and you have many options including the Hong Kong Express, taxis and various buses. HKIA is an extremely easy and preferable transit airport. With many restaurants and lots of duty free shopping there is a lot to do between flights. There is a Baggage storage or left luggage room in Terminal 1. It is located in the Meeters and Greeters Hall on Level 5, and is open from 5:30 am to 1:30 am every day. You can store your bags at a rate of HKD $10/piece/hour or HKD $120 per day. Most airlines have lounges, if you qualify to use them, otherwise you can use the "pay to use" lounge, The Plaza Premium Lounge, located in between the two terminals. You can get a shower, a massage, have a nap and something to eat, for a fee. You can get free WiFi anywhere in the airport.. If you have your ongoing boarding pass, once you land, follow the departure level signs for your boarding gate and you will be directed through security. Make sure you are at your gate at least 30 minutes ahead of time. If you don't have a boarding pass when you land, check for your airlines desk location (look on the boards or look for an ambassador). The airline desks are in area E1, E2 or W1 and then check in. Then go to your gate after passing through security. Go to your gate at least 30 minutes before departure. You can also connect to ferries to Macau China or mainland China. Follow the signs for both. 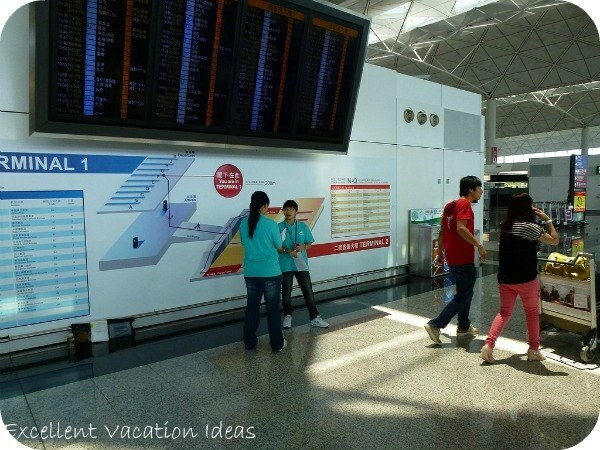 HKIA provides an easy to read and use leaflet for transferring through the Hong Kong International airport here. 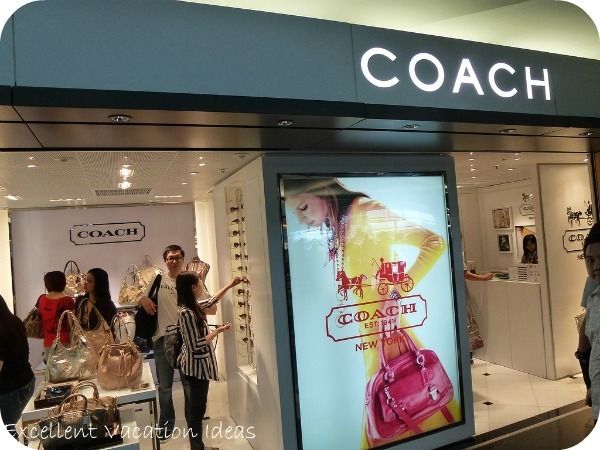 When travelling into the city from the airport, taking the Airport Express is the easiest and a cost effective way to get yourself and your luggage into Kowloon, or Hong Kong Island.